catch up with him and some of the other walkers when they have recovered from their fundraising walk. Carol has provided us with the following update. 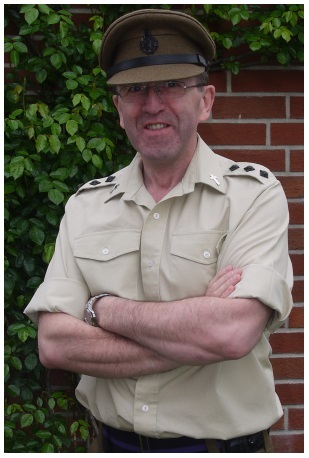 Padre Andrew is originally from Northern Ireland and has been at Ledra Palace since October as part of his 6 month tour of duty. He wanted to do something for both sides of the line before the end of his tour of duty. Hence the idea of the walk. Donations are being invited on the Virgin Money Giving fundraising website through The Padre & His Pacemakers page shown below. Can I please ask for your support? We have taken note Carol, and made a donation on behalf of cyprusscene.com via the link supplied. If anyone wishes to make a donation please use the link shown below. It is very easy. “Hi, thanks for visiting our page. 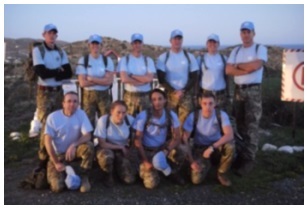 We are walking the length of the United Nations Buffer Zone (180km) across the beautiful island of Cyprus. The walk has now been completed and Carol and her husband James went to meet up with the group when they arrived in Famagusta. This is what the Padre had to say at the end of the walk. The words that come to mind are – exhausting and incredibly demanding. It was without doubt a very demanding exercise and at times it was simply a case of taking one painful step after another, but by the grace of God we covered the distance. Morale was low towards the end of day two which was a particularly demanding leg of the exercise involving walking from 0600 to 2230 to make our target. We had one casualty who, unfortunately, was unable to finish the walk as due to sheer exhaustion sprained her ankle. Most suffered very sore feet but were determined to make it to the end for such a good cause. Their efforts were immense. Thank you so much for your overwhelming support in all of this. I can’t express just how much I appreciate it. Money continues to come in to the Virgin Money Giving site and we even received some donations from the soldiers of Sectors One and Four whose practical support in terms of guidance and encouragement was simply outstanding. Warm good wishes for now. Thank you, they did well.